Where will you find one the most unique mascots in college football? Look no further than in the heart of America in Norman, Oklahoma where the Sooner Schooner brings the crowd at Memorial Stadium to its feet each time Oklahoma scores. Pulled by two white ponies, the Sooner Schooner is a miniature version of the Conestoga wagon used by settlers of Oklahoma. It is driven by members of the all-male spirit organization and has been part of Oklahoma football since 1964. The history of Memorial Stadium dates back to the early 1920s when a group of students formed a committee to look into building a new stadium for the Sooners. Coach Bennie Owen helped secure much of the funding and in 1921 construction began on the Sooners new facility. Completed in two years, Memorial Stadium was named in honor of University personnel who died in World War I and the field was named in honor of Owen. The Sooners played their first game at Memorial Stadium on October 20, 1923 against Washington University. Built at a cost of $293,000, the stadium originally 16,000 seats on the west side of the field. As support for the team grew over the years so did the stadium. In 1929, an additional 16,000 seats were added to the east side of Memorial Stadium. By 1949, the playing field was lowered and the running track was removed. New seating areas along the field and in the north end zone increased the capacity to 55,000. Expansion continued in the 1950s when the south endzone bleachers were added increasing the seating capacity to 61,836. Like many other teams in the 1960s and ’70s, the grass field was replaced with Astroturf before the 1970 season. The upper deck on the west side and press box were constructed in 1975, boosting the capacity to 70,000. By 1980, the temporary bleachers that had been in the south endzone since 1957, were removed and replaced with permanent ones. This gave Memorial Stadium a seating capacity of 75,000. The artificial surface was removed before the 1994 season and replaced with natural grass. In 1995, nine suites were constructed on the west side and a new video/scoreboard was installed along with lights. A large renovation and expansion plan at Memorial Stadium was completed before the 2002 season. An upper deck was constructed on the east side of the stadium as 8,000 seats and 27 luxury suites were added. The facade of the north and west sides of Memorial Stadium were upgraded to match the Cherokee Gothic look of the Oklahoma campus. Furthermore, the video and audio systems were upgraded as new scoreboards were placed in both endzones. HD video/scoreboards were added in 2007. 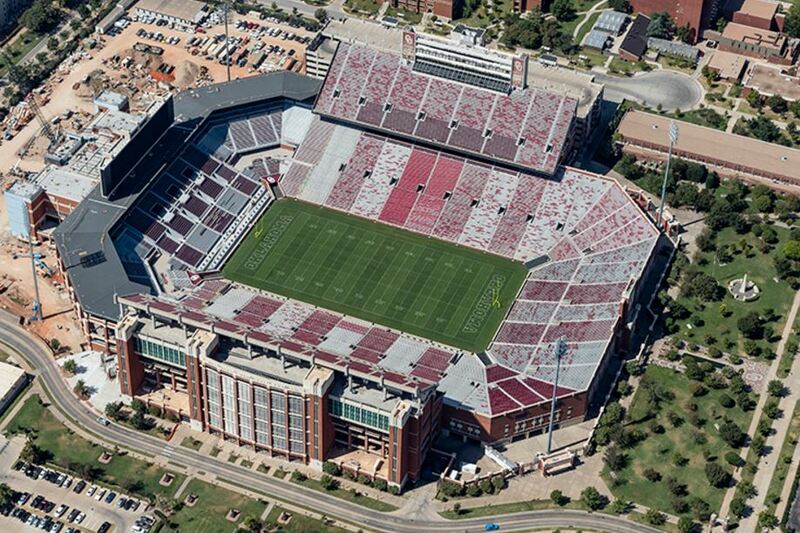 The latest project completed at Memorial Stadium enhances the gameday experience at Oklahoma games. Before the start of the 2016 the south endzone was completely revamped. The area includes lounge and club seats, but the most noticeable difference is the new massive scoreboard. Measuring 166 by 31 feet, it is one of the largest in college sports. This project is part of a $160 million multi-year project that will eventually include an updated and revamped west side of the stadium. 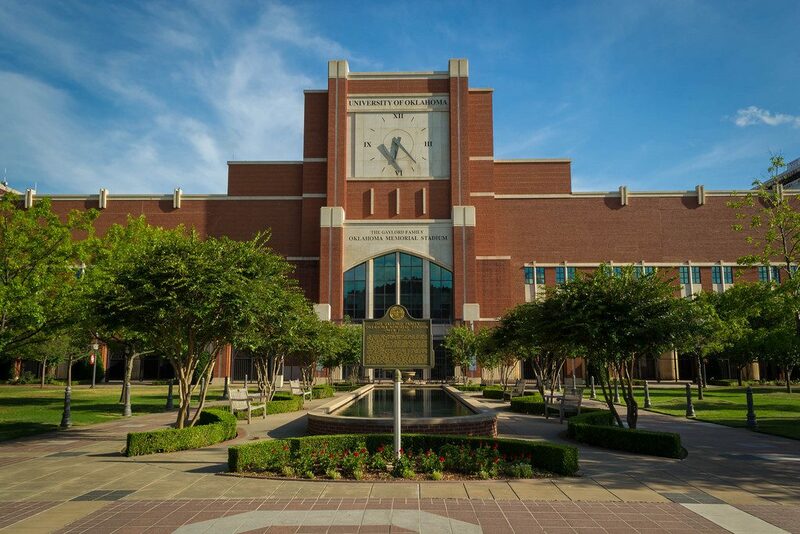 Today, the stadium has a seating capacity of 84,000 and has been the home to many legendary teams and players as the Sooners have won seven national titles and 45 conference championships.